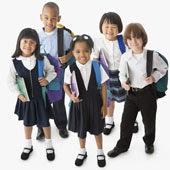 Organize and access back-to-school supplies you have and which ones you need. Do it early at least one month before school starts because last minute planning will increase stress. Find out if the classroom teacher will request specific supplies before you shop. Have a fashion show from your kids’ current wardrobe to see what fits. Purchase important pieces first like jeans/pants, shoes and cool-weather jackets. Two weeks prior to the start of the new school year decide on bedtime and wake up times, when to leave for school and return, homework times, music, practice, etc. Get the house ready: Set up one area for backpacks, shoes, coats and lunch sacks for easier mornings; Decide where you’ll store school papers and homework; De-clutter kids’ rooms to start the new school year fresh; Decide with your child when and where homework gets done. Do a dry run of a typical morning and instead of driving to school surprise the kids with a trip to the beach, Water Park or breakfast. Have your child make a list of favorite lunch foods. Refer to it each week as you grocery shop. Agree upon breakfast and lunch ahead of time because it will avoid stress in the morning when your child doesn’t like what you prepared for breakfast or their lunch box. Your child can do the pack lunch! Designate three areas in the fridge or cupboard that contain acceptable lunch foods and have your child pick one from each. For example, one area holds pre-made sandwiches, another holds fruit and veggies, and another holds snack bars, nuts and crackers. Get the brains working again by continuing reading to your children or make sure they are completing their summer reading list. Mix in some math facts and vocabulary or spelling tests to get the children thinking again. Help your child gain the confidence to meet new friends. Role-play as a classmate to help your child introduce him/herself and suggest a game. Have an End-of-Summer party to mark the change. Organize the back to school season with a family calendar that the whole family can access and update. Even elementary-aged children can be involved with reviewing the week’s schedule and adding events and activities. Meet with the whole family in early August to put scheduled events on the August and September calendar. Don’t just schedule work, practice, lessons and appointments. Block out time for family fun and family outings. Cozi.com is a great way for families to organize their activities - go check it out and help make this school year the best it can be - and best of all, it's free!